La Niña conditions have continued for another month at weak-to-moderate strength, with both atmospheric and oceanic conditions, including sea-surface temperatures (SSTs), demonstrating a consistent La Niña pattern (Figs. 1-2). 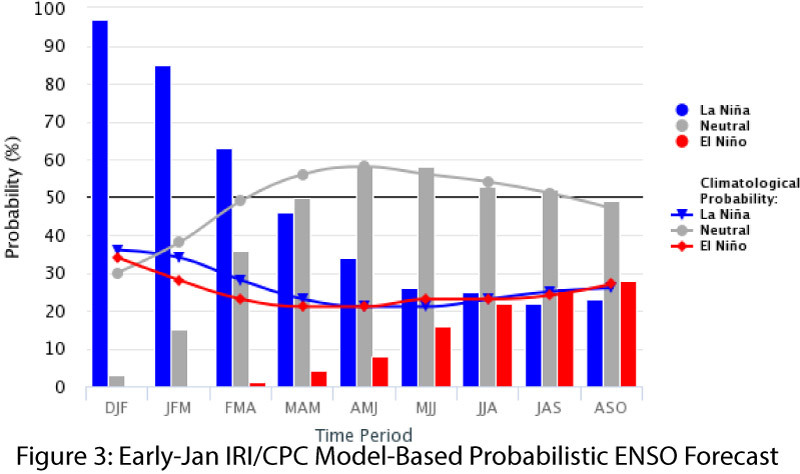 Forecasts continue to suggest that a weak-to-moderate La Niña event will last through the winter before weakening this spring. On Jan. 11, the Japanese Meteorological Agency (JMA) identified ongoing La Niña conditions and called for a 70-percent chance of these conditions persisting through spring 2018. 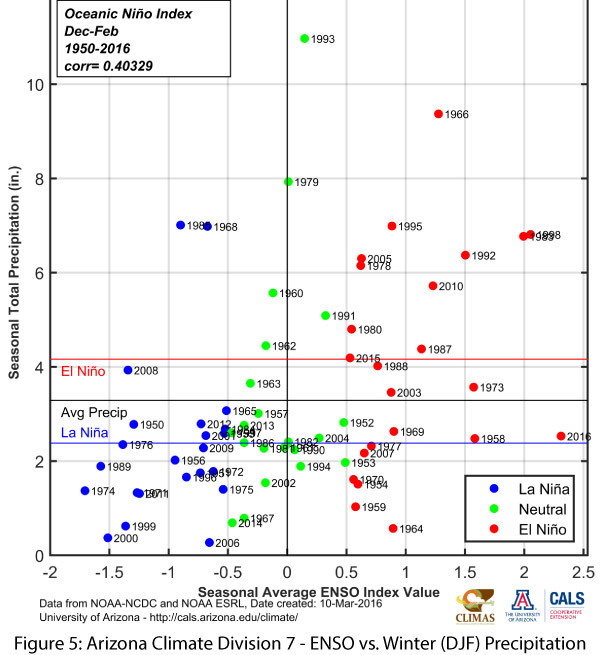 On Jan. 11, the NOAA Climate Prediction Center (CPC) continued its La Niña advisory, identifying an 85-95-percent chance of La Niña conditions lasting through the winter, with a transition to ENSO-neutral in the spring. 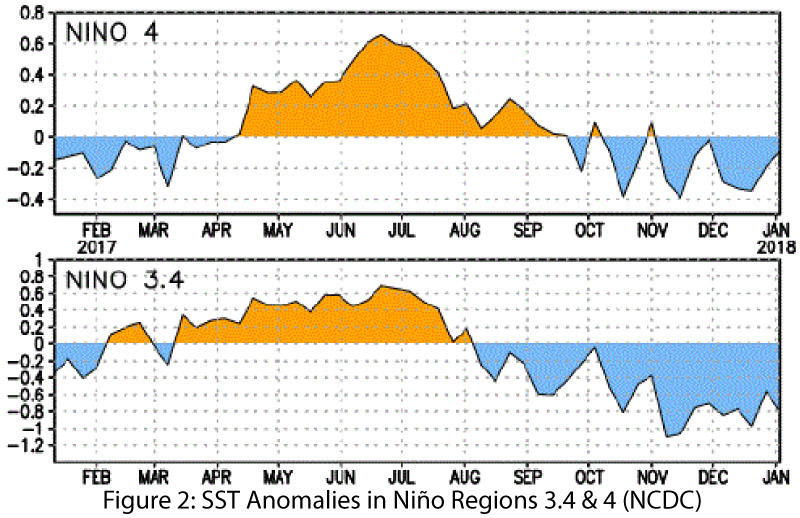 On Jan. 11, the International Research Institute (IRI) issued its ENSO quick look, calling for La Niña to last into the spring (Fig. 3) as a weak event, but with recognition that the conditions were very close to the threshold for a moderate event. On Jan. 16, the Australian Bureau of Meteorology updated its ENSO tracker to reflect continued La Niña conditions, but noted that this event “may be nearing its peak,” with a return to neutral values by spring 2018. 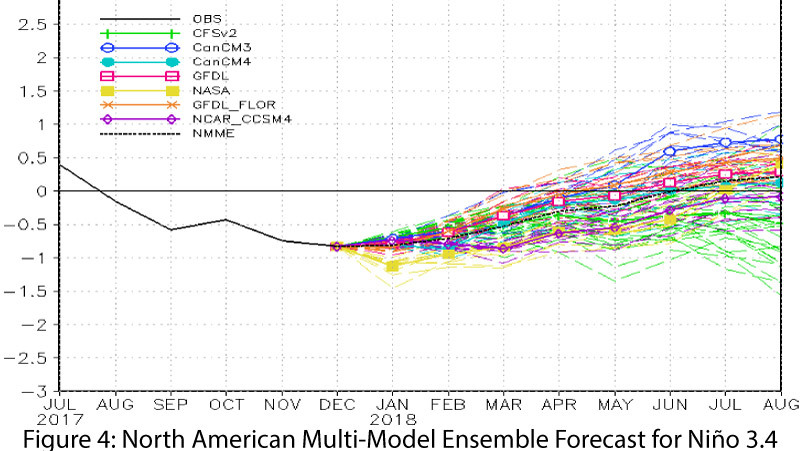 The North American Multi-Model Ensemble (NMME) is consistently indicative of a La Niña event of weak to moderate intensity this winter (Fig. 4). Summary: Given the consistent La Niña patterns observed in both oceanic and atmospheric indicators, seasonal outlooks forecast that La Niña will last through the winter. Current conditions reflect a borderline weak-to-moderate event. Warmer- and drier-than-average winter conditions are associated with La Niña of any strength in the Southwest, so the presence of La Niña is certain to heighten concerns about winter precipitation and drought. 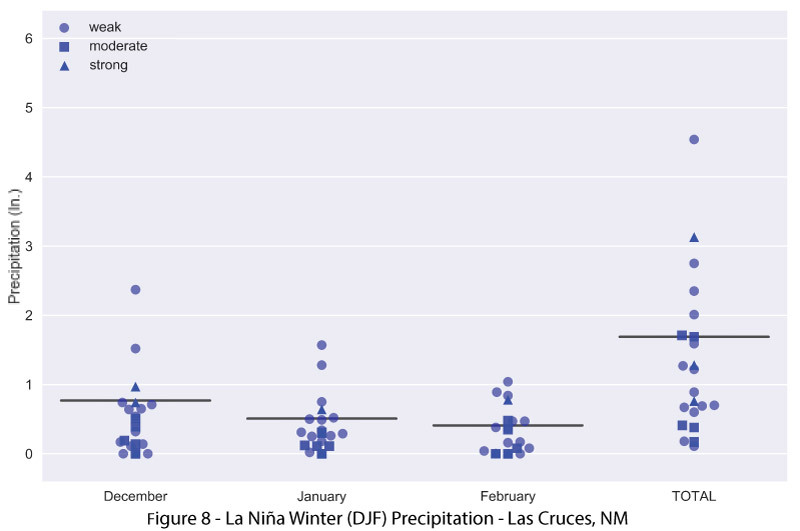 Southwestern winters are already relatively dry, however, so La Niña does not ensure an exceptionally dry winter (although this is the trajectory much of the Southwest appears to currently be on), but it does take a wetter-than-average winter off the table based on past La Niña events. If the La Niña strengthens to moderate intensity, the likelihood of an even drier Southwest winter increases (see the following page for a few examples). 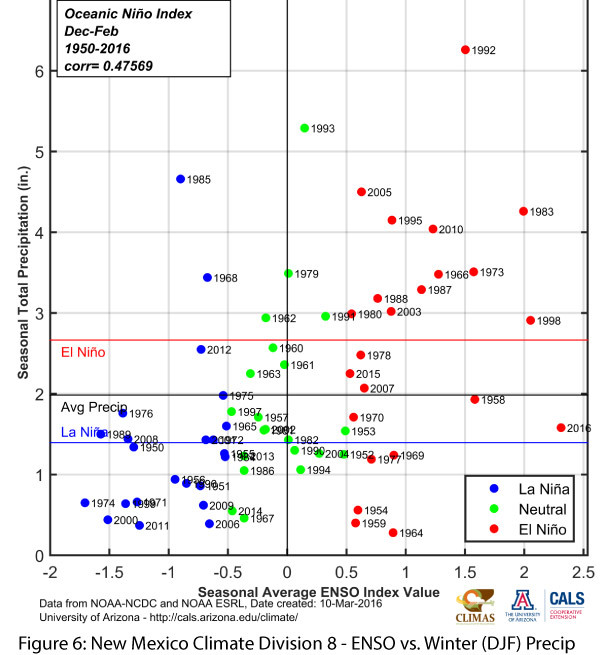 Winter precipitation (Dec-Feb (DJF)), during most weak La Niña events (ENSO Index Value between -0.5 and -1.0) has been below average, although a few years (1968, 1985) were notable outliers (Figs. 5-6). 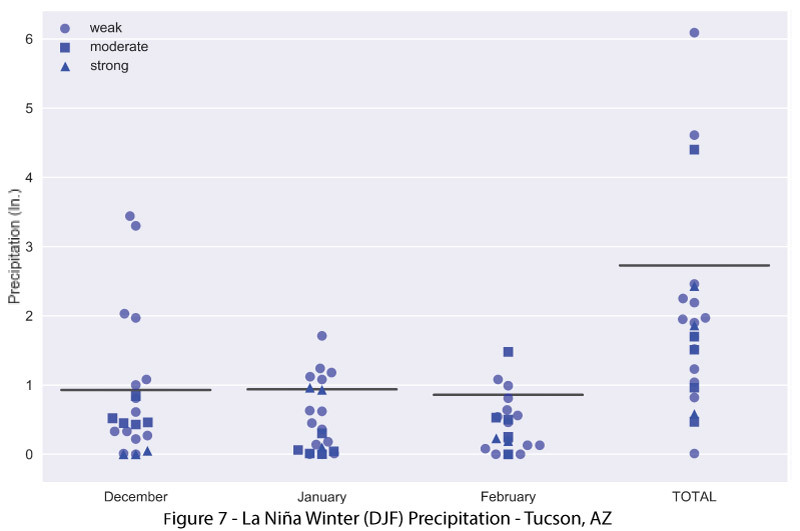 The monthly breakdown of weak, moderate, and strong La Niña events reveals that while the DJF totals for Tucson, AZ and Las Cruces, NM have been mostly below average (Figs. 7-8), there have been individual months that recorded precipitation above the monthly average (represented by black lines on the plots). The most likely outcome for the Southwest this year is below-average precipitation totals for the winter season, but the way that these events unfold will have an impact on how residents perceive and experience this La Niña event.